You are not ExxonMobil, DowDupont, or Vodafone – but how do you still deliver sound corporate governance to a small and distributed JV portfolio? In Water Street Partners' research study, we had discussions with more than 100 companies holding small JV portfolios. These conversations reveal that the vast majority of such companies have taken no meaningful steps to bring consistency or coherence to corporate-level governance, assurance, and oversight of their JVs. Most small-portfolio companies recognize that joint ventures introduce some corporate risks – but, lacking scale and experience with JVs, either do not know where to start, or have a hard time justifying a corporate investment that seems large relative to the size of the portfolio. We believe that the risks and benefits are larger than typically realized, and that the needed level of investment is smaller than most companies appreciate. The purpose of this note is to offer a limited number of practices – seven standards of small JV portfolio excellence – designed to bring greater consistency to the governance of the JV portfolio. We believe that these standards can significantly reduce joint venture risks and costs, and improve performance – regardless of portfolio size. They also instill a solid platform for more sophisticated JV portfolio governance, should a company’s portfolio grow over time. SMALL PORTFOLIO GOVERNANCE – WHY CARE? 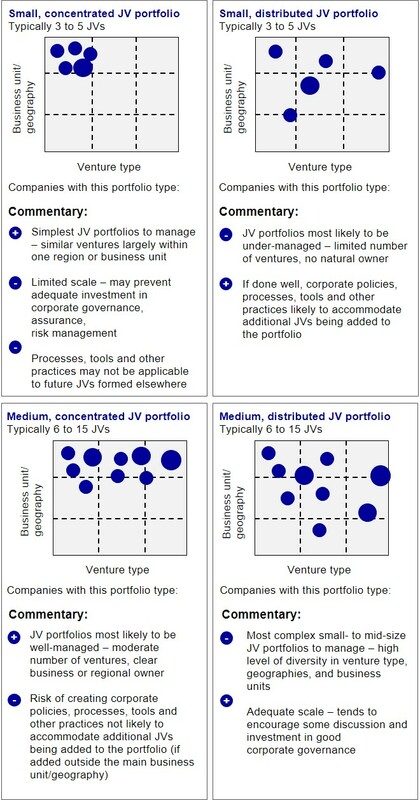 Even companies with small JV portfolios face at least three potential JV-related challenges: (i) small costs and risks that are painful, though not apparent to the public; (ii) large and public costs or risks if individual JVs experience problems; and (iii) the risk that their small portfolios may quickly grow into much larger JV portfolios. Small, painful, but private costs. Consider the experiences of a U.S. industrial company: The lack of understanding of how its corporate investment stage-gate process applied to JVs meant that a six-person deal team worked night and day for nine months on a transaction in Latin America before the CEO and CFO heard about it – and they promptly killed the deal, refusing to share certain intellectual property with their counterparty. Or consider a European consumer goods company, where several of its joint ventures have been exposed to what one of its JV CEOs called “cruel and unusual reporting punishment.” Lacking a framework for how to provide oversight to joint ventures that they do not control, the company’s finance and audit staff have demanded that the JVs comply with all reporting requirements and corporate standards as if it was a wholly-owned affiliate – even though these ventures run on their own processes and systems, and often have their own audit unit. This causes a significant joint venture “governance tax,” as time is spent dealing with overwhelming parent requests, rather than on running the business. Large and public costs. Consider the experience of the New Zealand dairy company. A JV that it formed in China – in which Fonterra owned a minority stake – created substantial reputational damage and financial exposure to the company when the JV sold contaminated infant formula, causing widespread illness. The crisis resulted in a $139 million write-down at Fonterra, the bankruptcy of the JV, and years of reputational damage, and necessitated a rapid shake-up of Fonterra’s corporate strategy for the Chinese market. JVs have plenty of less spectacular, but still painful, ways in which they can drag down company performance, or fail to deliver expected benefits if not carefully watched. Just ask the European energy company that was surprised to learn at the last minute that a material JV would experience a delay in starting production, a delay that caused a 10% drop in the company’s share price when announced. The bottom line is that most business unit leaders recognize the need for some corporate guidance on joint venture governance. JV portfolio growth. For many companies, joint ventures are not just a one-off solution to a non-recurring problem. Instead, companies that want to quickly access new markets, meet regulatory restrictions, tap into lower operating costs, or grow with more limited allocations of capital will keep turning to joint ventures – and the portfolio will continue to grow. In our view, it is better to lay the groundwork for preventing potential problems while the JV portfolio is small, rather than waiting until the JV portfolio is large and causing real difficulties. The bottom line is that most business unit leaders recognize the need for some corporate guidance on joint venture governance. For instance, many business managers sitting on JV Boards realize that they are exposed to personal liabilities, and would welcome some added training and explanation for how to perform their role effectively and within the bounds of changing legal and regulatory regimes. Those business managers and others in corporate functions would also welcome added clarity on corporate reporting and assurance requirements, especially in ventures that the company does not control. The challenge is finding the time – and the corporate center of gravity – to get things moving. Water Street Partners has benchmarked how large natural resource companies govern their portfolio of JVs. The principal focus of this work has been on companies with large JV portfolios – in some cases, hundreds of ventures. This benchmarking has identified more than 150 different corporate-level practices that companies are using to better govern their venture portfolios, with the aim of better understanding and improving JV risks and performance, and unlocking upside value. As part of this work, we have developed a set of standards of JV portfolio excellence for these companies. But these practices and standards are simply too heavy for companies with small joint venture portfolios. To that end, Water Street Partners recently developed a version of these standards applicable to companies with 3 to 15 JVs. We believe that all companies need to raise the level of transparency, accountability, and discipline in the governance of their joint ventures – at the individual venture and the portfolio level. Our hope is that these seven standards of small JV portfolio excellence will advance the joint venture governance dialogue in companies with small to moderately sized portfolios – and serve as a roadmap for them to improve their corporate governance. These standards assume that the company’s venture portfolio contains at least some 50:50 or minority ventures – that is, that the company cannot simply dictate that its ventures adopt the company’s policies, procedures, and practices on a wholesale basis. Also, please bear in mind that the implementation of these standards requires action – and cooperation – across the corporate, business unit, and joint venture levels. Water Street Partners helps companies bring consistency to the corporate-level governance, assurance and management of joint ventures to significantly reduce joint venture risks and costs, and improve performance. Our “Standards of Joint Venture Portfolio Management Excellence” are the benchmark against which some of the most sophisticated companies in the world measure themselves. Learn More. Jim is a co-founder of Water Street Partners, where he serves a global client base across industries on joint venture issues. He has supported more than 200 joint venture transactions and restructurings during his career, and has worked extensively on JV governance, organizational, and commercial matters. Prior to Water Street, he co-led the Joint Venture Practice at McKinsey & Company.